Yesterday morning we left for two days in Indianapolis. We needed to get away for the kids' spring break and also take a break from all the stressful house hunting. We had a nice time. The weather yesterday was great. Sunny, 80s, and some wind. Perfect for going to the zoo. Here's the picture I should have used for yesterday. 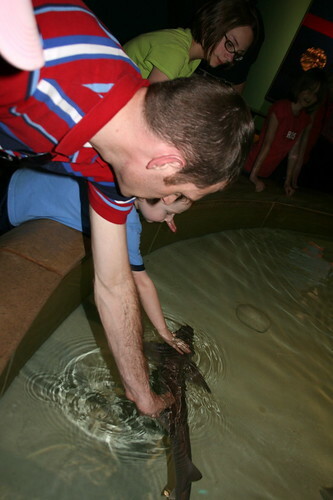 They actually let you pet the sharks. I touched one. It was weird feeling. Today we took the kids to the Children's Museum. We haven't been in a while. In the beginning it was good. All the kids were happy. Here's the proof. But the longer we were there the grouchier everyone got. Some of it was that they (okay, all of us) could have used more sleep. (We stayed at a great Homewood Suites. They had an indoor pool. The kids got to burn off extra energy swimming last night and this morning. The hotel was also on Meridian. If you've been to Indy you know that's the main street. The traffic was LOUD until about midnight.) Back to the museum. It was crowded. The kids were getting tired. 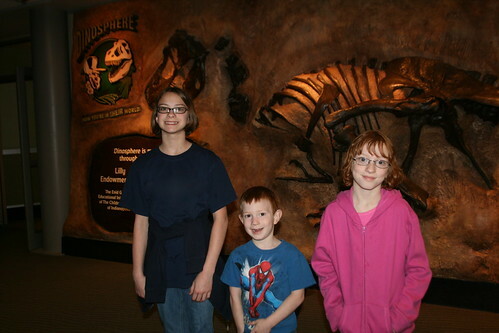 They also had to take turns looking at the exhibits which was boring for some of them. They were ready to go about halfway through. We stuck it out and rewarded ourselves with a trip down a big slide and some ice cream. When I'm not stressed out and busy (not sure when that will be) I will take an hour to look through all 269 pictures I took the last two days and then post a link to them. As for right now, I'm going to climb into bed so I can have enough energy to go house hunting, again.